Marvering is a hot-worked glass technique in which decorative trails of molten glass are applied to a vessel by rolling it on a marver - a flat stone or iron surface. 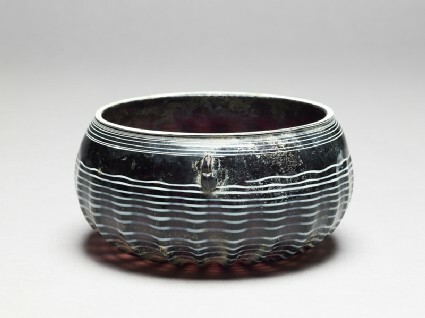 A technique developed by the Romans, Marvered glass continued to be used throughout late antiquity for various kinds of objects, from everyday vessels, to cosmetic flasks, and even weights. In the Islamic world, the production of marvered glass appears to have peaked during the 12th and 13th century in Syria and Egypt, from where most of the extant vessels seem to originate. Purchased with the assistance of the Friends of the Ashmolean Museum, 1975. Decorative glass created by rolling hot and malleable glass over a flat surface known as marver, to create smooth sides or to consolidate applied decoration.